In late September 2015, Hurricane Joaquin swept past the Bahamas and swallowed a pair of cargo vessels in its destructive path: El Faro, a 790-foot American behemoth with a crew of thirty-three, and the Minouche, a 230-foot freighter with a dozen sailors aboard. From the parallel stories of these ships and their final journeys, Tristram Korten weaves a remarkable tale of two veteran sea captains from very different worlds, the harrowing ordeals of their desperate crews, and the Coast Guard’s extraordinary battle against a storm that defied prediction. When the Coast Guard received word from Captain Renelo Gelera that the Minouche was taking on water on the night of October 1, the servicemen on duty helicoptered through Joaquin to the sinking ship. Rescue swimmer Ben Cournia dropped into the sea—in the middle of a raging tropical cyclone, in the dark—and churned through the monstrous swells, loading survivors into a rescue basket dangling from the helicopter as its pilot struggled against the tempest. With pulsating narrative skill in the tradition of Sebastian Junger and Jon Krakauer, Korten recounts the heroic efforts by Cournia and his fellow guardsmen to haul the Minouche’s crew to safety. Tragically, things would not go as well for Captain Michael Davidson and El Faro. Despite exhaustive searching by her would-be rescuers, the loss of the vessel became the largest U.S. maritime disaster in decades. 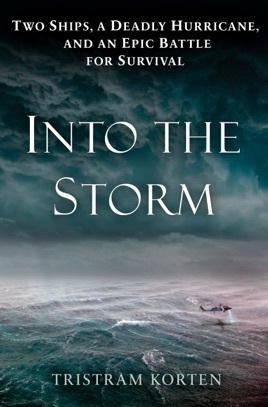 As Korten narrates the ships’ fates, with insights drawn from insider access to crew members, Coast Guard teams, and their families, he delivers a moving and propulsive story of men in peril, the international brotherhood of mariners, and the breathtaking power of nature.